Planning a trip to Norway? You’ve come to the right place! From the best hikes in Norway, to seeing the Northern Lights, beautiful train rides, fjords, and wildlife, to the unforgettable landscapes. Here are The Best Places to Visit in Norway! Disclosure: This Best Places to Visit in Norway travel guide contains affiliate links. That means we may earn a small commission when you use the links on this site to book a hotel, buy your travel insurance, shop for travel essentials, etc.. You don’t pay anything extra. If you’d like to learn more about how this works, you can read more under our Disclaimer page. There are some amazing places to see in Norway. 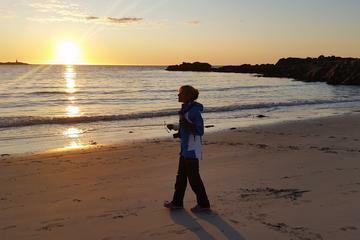 It is home to some of the most exquisite and surreal sceneries known to man. With beautiful fjords, spectacular Northern lights, and a rich ancient history, it’s no wonder many Norway locations are near the top of almost every traveler’s bucket list. Whether you’re planning to go backpacking in Norway, want to hop up and down the coast via the famous Hurtigruten coastal ferry, or are planning a Norwegian train trip, you’re sure to find travel in Norway is a great adventure, with timeless memories awaiting you at every stop. For anyone who wants to experience all the highlights and the most beautiful places in Norway in one trip, I’ve pulled together my picks for the 10 best places to see in Norway. From Oslo’s urban vibe to Svalbard’s Arctic life, the sites included on this list span this diverse country, and are sure to inspire you while you plan own trip to Norway! For art and history lovers, it’s hard to beat a trip to Oslo. Top-notch art galleries and museums are one of Oslo’s most endearing qualities, and the museums here are far from typical. Home to some of the world’s richest artifacts, don’t miss the Norwegian Maritime Museum and Viking Ship Museum, home to the impressive 9th-century Oseberg Viking ship. They routinely top the best things to do in Oslo lists with good reason. If walking on the roof of a building is on your bucket list, visit the Oslo Opera house, one of the city’s go-to hang out spots every summer. Staying in Oslo? Check out Our Where to Stay in Oslo neighborhood guide here! Included in UNESCO’s list for World Cultural Heritage sites, Bryggen’s colorful Hanseatic historic buildings, which line Vågen harbor’s eastern side, are one of Bergen’s most iconic attractions. Enjoy fresh seafood and other local delicacies while taking in the beautiful wharf and buildings; check out the Market Square, where local fishermen land their early morning catches; and stop in at the Hanseatic Museum for a history lesson. When you’re finished exploring the historic Bryggen area, catch the majestic funicular railway up Mount Fløyen. After a few minutes on the funicular, you’ll arrive at the top of Mount Fløyen, one of Norway’s most popular attractions with magnificent views. Spend some time soaking in the ambience, studying the cityscape below, and appreciating the fjords surrounding Bergen. If you get hungry, you can enjoy a mountaintop meal at one of Mt. Fløyen’s restaurants and cafeteria. You can catch the railway in the city center, just 150 meters from Bryggen and the Fish Market. Or, if you’re feeling particularly energetic, you can take your adventure to the next level by hiking or mountain biking your way to the top! It may take a bit of time and a lot of sweat to reach the top of Pulpit’s Rock, but it’s definitely worth it. In fact, the two-hour hike to Preikestolen’s Pulpit rock is likely to leave you breathless in more ways than one. With a plateau that looks as if it’s been carved with a knife and a mesmerizing view once you reach the top, Pulpit rock amazes and astonishes. From the top, you can catch great views of Lysefjord, a fjord in Norway’s southwest Ryfylke area. You can also enjoy a dip in several nice spots within the area, or relax in rest areas along the path. This is easily one of the best hikes in Norway. Even the film-makers of Mission Impossible are huge fans of the Pulpit rock: they recently closed the Preikestolen to film the next sequel! For safety purposes, always check the weather before your hike, and consider hiring an experienced guide to accompany you. The Troll’s Tongue in Odda, otherwise known as Trolltunga, is one of the absolute must-visit places in Norway. Hanging 700 meters over the beautiful Rindalsvatnet Lake, with an altitude of 1,100 meters, Trolltunga is considered to be one of Norway’s most spectacular fjord landscapes. From the trailhead in Skjeggedal, the roundtrip hike usually takes 10 to 12 hours and traverses 27.5 kilometers in total. While it can be a long, tiring, and draining hike, the view once you get there will surely make you forget about all the effort it took. Another of the best hikes Norway has to offer! Spotting the Northern Lights / Aurora Borealis is every visitor to Norway’s dream, and it’s little wonder: the unbelievable colors dancing across the sky do seem to create a magical, indescribable moment! If you’re among those who want to witness the Northern lights in Norway, it’s best to visit Northern Norway during the Arctic winter’s long night, from October to March. To be more specific, consider going to Bodø, Tromsø or Svalbard, as these areas are often considered to be the best places to see the Northern Lights in Norway. Head deep into the fjords with professional guides for an unforgettable arctic adventure. Sit fireside, enjoy warm drinks and snacks between photos of one of nature’s most breathtaking displays. A ferry trip through the lovely Geirangerfjord is another of the best things to do in Norway experiences, and is often at the top of traveler’s wish lists. This lovely fjord made it onto UNESCO’s World Heritage List, and once you see it, you’ll understand why. Surrounded by vibrant vegetation, mountains that tower 1600 to 1700 meters high above the water, and wonderful waterfalls, the entire area is jaw dropping. If you want to get a little off the beaten tourist track, a visit to some of the deserted fjord farms located high up on the cliff sides makes for an interesting side trip. You can visit Syltevik, Blomberg, Westerås, Knivsflå, Matvik, and Skageflå, and can even stay overnight at Westerås, and enjoy some of the local foods offered at its outdoor restaurant while also enjoying the breathtaking view of the fjord! Did You Know That Geiranger Has a Hop on/Hop off Bus? They sure do! It has four stops, and the views are extraordinary. It takes you up to the look out platform to get that famous view of the fjord and the town. It beats walking up, plus you’ll learn about the history on the way! 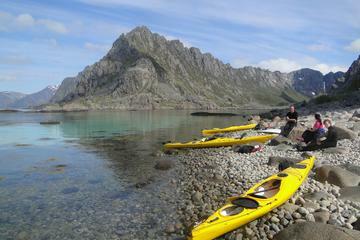 The current darling of Norwegian tourism, it seems that everyone wants to visit Lofoten these days! With spectacular natural scenery, excellent fishing areas, small villages, and a midnight sun that extends the day each summer, Lofoten is currently one of the most famous areas to visit in Norway. Although Lofoten is also popular for its dramatic and picturesque winters, the best time to visit Lofoten is summer, especially in July and August. Throughout the summer, you’re most likely to enjoy good weather, allowing you to maximize time spent on outdoor activities such as biking, kayaking, and fishing, among others. You can also take long walks in the beach at midnight, go on a mountain hike, watch the sun envelope the sea, or enjoy a quiet night with a campfire. There are so many things to do in Lofoten and a midnight sun at the height of summer, you might find yourself struggling to find time to sleep! Definitely not for the faint-hearted, Kjeragbolten is Norway’s most famous boulder! Situated on Kjerag Mountain in Forsand municipality, the 5-cubic-meter rock is precariously wedged into a crevasse on the mountain. While you can easily access it without using any climbing equipment, you will need a lot of courage: the rock is suspended above a 3,228-foot (984 meters) deep abyss, with a few chains attached the mountain to help you on the way up. Once at the top, some say the hike isn’t complete without a picture taken standing on the boulder. And while it seems to make a perfect photo spot for those who are brave enough, you really do need to be extra careful while you’re on it. Proceed at your own risk. In addition to being one of the best places in Norway to see the Northern Lights, Svalbard is famous for its polar bears, with these majestic creatures taking the spotlight in this arctic area of Norway. For nature lovers and those who are up for an adventure, a trip to Norway isn’t complete without spotting polar bears in Svalbard. Polar bears have been taking refuge in Svalbard over a number of years, and it’s believed their population has increased to as many as 3,000. The best time to see polar bears in Svalbard is between May and September. In May, the ice hasn’t yet melted, making this the ideal month to visit. Between August and September, you can witness the ice melt and see polar bears on the remaining icy patches in the area. Considered one of the world’s most beautiful train journeys, this spectacular journey from Myrdal to Flam shows off some of Western Norway’s most picturesque scenery, without any stress: sit back, relax, and take some time to appreciate what a beautiful world we live in. It took two decades to finish building this famous line, and all the hard work has clearly paid off: the Flam Railway is among Norway’s most popular attractions! The 2-hour round trip showcases some of most magnificent scenery in the world, taking you through 20 tunnels and past breathtaking views of the waterfalls and mountains. It also includes a quick stop at the beautiful Kjosfossen waterfall, and allows you to spend time in Flam before heading back to Myrdal. If Norway wasn’t on your list of countries to visit before, I hope my picks for the 10 best places to visit in Norway has you reconsidering. With beautiful fjords, vibrant cities, icy landscapes, and wonderful wildlife waiting to be discovered, travelers are sure to enjoy their time exploring the country’s rich culture and history, and unmatched views. Health care worker by trade, adventurer by passion, and blogger wherever he goes, Pierre writes about his travels and his life at Anything Under Our Stars. Passionate about inspiring others to travel and discover the world, see new places, and experience different cultures, Pierre has lived in Norway since 2014. Never tiring of the wonders of adventure, he pushes his boundaries time and again in order to broaden his horizons and share what he finds with the world at large. Thanks for linking to our guide on hiking the epic Trolltunga trail! Happy travels and hope to meet you guys somewhere in the world one day! Norway is the most wonderful place I ever have seen before. It has many wonderful and adventures places. Those are really beautiful. 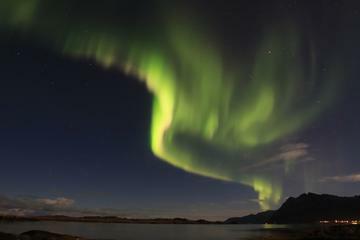 Northern Lights in Northern Norway, Polar Bears in Svalbard is the nice place. I want to go there. We absolutely fell in love with Norway last year, sadly we didn’t go too far north, but we must make it up to Svalbard one day!